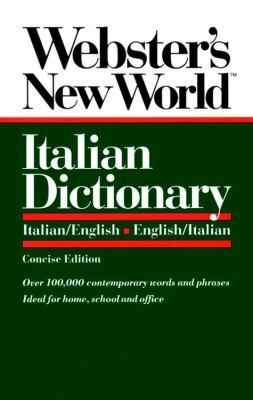 by Webster's New World Staff, Love, Catherine E.
Webster's New World Staff, Love, Catherine E.
Webster's New World Italian Dictionary Italian/English '– English/Italian Concise Edition The combination of extensive coverage and outstanding clarity, simplicity and economy makes this dictionary ideal for home, school and office use. Extensive Coverage-The most frequently used words in both languages are detailed, helping the user to understand and to translate idiomatically. Examples of Usage-Thousands of phrases show how the meanings of words can vary in different contexts. Special Features-Other aids include pronunciation guides, comprehensive Italian verb tables and full treatment of English phrasal verbs. Also available: Webster's New World French Dictionary (Concise Edition) Webster's New World German Dictionary (Concise Edition) Webster's New World Spanish Dictionary (Concise Edition)Webster's New World Staff is the author of 'Webster's New World Italian Dictionary/Italian/English-English/Italian', published 1992 under ISBN 9780139536397 and ISBN 0139536396.